It is citrus season in Northern California. Pomelos, blood oranges, grapefruit, clementines, mandarin oranges and cocktail fruit are readily available at reasonable prices. 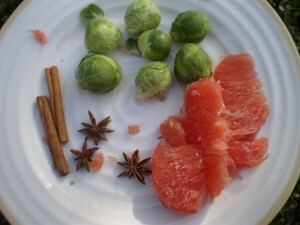 I am obsessed with citrus, especially pomelos and blood oranges – great colors, delicious taste. (Expect a blood orange recipe soon.) 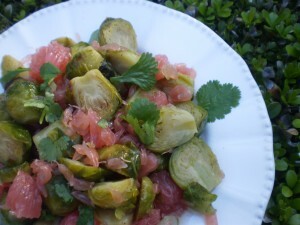 While skimming through Yotam Ottolenghi’s vegetarian cookbook Plenty More looking for a new salad to serve on Shabbat, I spotted a pomelo recipe paired with brussels sprouts, roasted brussels sprouts to be exact. And it had star anise in it. I love star anise – it brings out a certain, unique flavor in foods. I was sold eventhough I believed it had limited appeal. My guests are my guinea pigs. I try to make sure there will be at least something they will eat – a green salad, some hummus, pasta, chicken – something, but after that I am free to experiment. I would love to report that there wasn’t any salad left after Shabbat – but actually there was a fair amount. Some of it was because I am sure the salad didn’t circulate well, but some of it was because this salad, though very good, is intense. The star anise and cinnamon stick simple syrup is strong. The roasted brussels sprouts were strong. 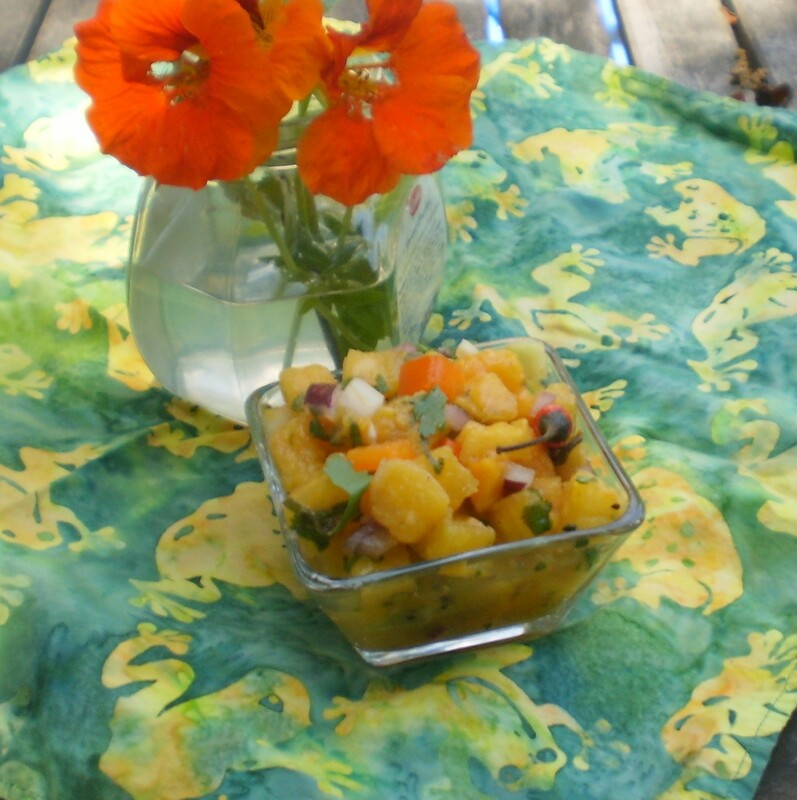 They did go together and looked amazing, but it is not a salad I will add in my rotation. I am printing it because sometimes you just have to try things and maybe this one will appeal to you. Recipe as written in Plenty More. My comments in italics. Place the sugar, 7 tbsp/100ml water, the cinnamon, and the star anise in a small saucepan and bring to a light simmer. Cook for 1 minute, stirring until the sugar dissolves, then remove from the heat, add 1 tablesppon of the lemon juice, and set aside to cool. Peel the thick skin off the pomelo and discard. Divide into segments, release the flesh from the membrane then break the flesh into bite-size pieces and put in a shallow bowl, taking care to remove all the bitter white membrane. Once the syrup has coooled a little, pour it over the pomelo. Leave to marinate for a least 1 hour, stirring occasionally. Preheat the oven to 425 ° F/220 ° C.
Before assembling the salad, remove and discard the cinnamon and star anise from the bowl, drain the pomelo, reserving the juices. Just before serving, put the shallots, sprouts, pomelo, and cilantro in a large bowl. Add the remaining 3 tablespoons oil, the remaining 2 tablespoons lemon juice, 1 tablespoon of the pomelo marinade juices, and 1/4 teaspoon salt. Gently mix, then check the seasoning – you might need to add another tablespoon of the marinade and serve.